Home » Healthcare Data Privacy » Do Medical Practices Need to Monitor Business Associates for HIPAA Compliance? Should covered entities monitor business associates for HIPAA compliance or is it sufficient just obtain a signed, HIPAA-compliant business associate agreement? If a business associate provides reasonable assurances to a covered entity that HIPAA Rules are being followed, and errors are made by the BA that result in the exposure, theft, or accidental disclosure of PHI, the covered entity will not be liable for the BA’s HIPAA violations – provided the covered entity has entered into a business associate agreement with its business associate. It is the responsibility of the business associate to ensure compliance with HIPAA Rules. The failure of a business associate to comply with HIPAA Rules can result in financial penalties for HIPAA violations for the business associate, not the covered entity. A covered entity should ‘obtain satisfactory assurances’ that HIPAA Rules will be followed prior to disclosing PHI. While covered entities are not required by HIPAA to monitor business associates for HIPAA compliance, they should obtain proof that their business associate has performed an organization-wide risk analysis, has developed a risk management plan, and is reducing risks to an acceptable and appropriate level. A covered entity will be in violation of HIPAA Rules if it “knew of a pattern of activity or practice of the business associate that constituted a material breach or violation of the business associate’s obligation under the contract or other arrangement, unless the covered entity took reasonable steps to cure the breach or end the violation.” If termination of the BAA is not feasible, the problem must be reported to the Department of Health and Human Services’ Office for Civil Rights (OCR). Even though a covered entity is not liable for business associate HIPAA violations, any business associate breach is likely to reflect badly on the covered entity and is likely to cause harm to its patients or members. It is therefore in the interests of both parties to ensure HIPAA Rules are being followed. 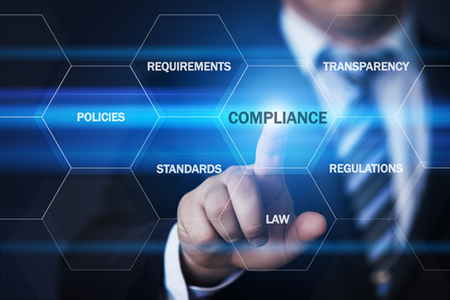 It may help to provide business associates with a HIPAA compliance checklist to assist them with their compliance efforts, and access to other resources to help them prevent breaches and mitigate risk.